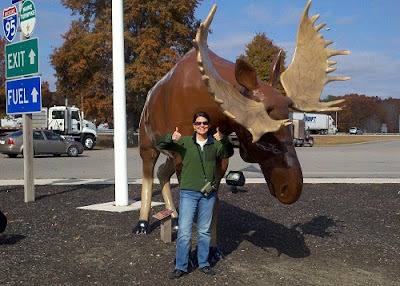 From Portland, Maine, Kenn writes: So here we are in Maine, and suddenly Moose are cavorting everywhere. Or, at least, representations of them are everywhere. This guy greeted us at the first service area on the Maine turnpike. In case you can't tell from this small photo, Kimberly is signalling two thumbs up, not some other kind of gesture that might be inspired by an elusive moose. Aside from the silent moose, everyone we meet right now is talking about the approaching late-season hurricane, Sandy, and its possible effects on the region. Of course we're keeping an eye on that as well. But the theme yesterday (Friday the 26th) was of surprisingly mild weather. The temperature reached the low 60s again, and even a few insects were active, adding to our trip tally. We had been surprised, a week ago, to see a few Monarchs on Cape Cod and in Rhode Island. Yesterday, later and farther north, we were even more surprised to see a few Monarchs winging their way south on the coast of Maine. They have a long way to go to get to their wintering area in southern Mexico, and this late in the season they would seem to be pushing their luck. But we also saw four other species of butterflies on the wing yesterday (Clouded Sulphur, Cabbage White, Painted Lady, and Red Admiral), more than I would have expected for Maine in late October. We had seen all of those earlier on the tour, but other insects such as Carolina Locust and a pond full of whirligig beetles added to our total. On Friday, after checking a couple of spots on the edge of Exeter, NH, that had been recommended to us by new local friends, our first destination was the Wild Bird Supply store in Freeport, Maine. The owners, Jeannette and Derek Lovitch, do a lot more than simply run a store; they support birding and conservation in major ways. Derek's book, How To Be a Better Birder, published this year by Princeton University Press, is an outstanding resource that is getting rave reviews. Kimberly and I had planned to arrive early so that we could get out birding with Derek for a couple of hours before our scheduled book signing, so he took us out for a quick run to local habitats. It was fun to explore the area, and it was also productive, netting new species for our list such as Greater White-fronted Goose and Pileated Woodpecker. Back at the store, a nice crowd showed up, and we were amazed and pleased that our friend Seth Benz showed up. Seth lives quite a ways up the coast, so it was out of his way to come and see us. Our birding history goes back many years: back in the early 1980s, Seth and I and some other friends went birding together around Peru, Mexico, and other destinations. More recently, for several years Seth Benz was the director of the Audubon Camp on Hog Island, Maine, where Kim and I both had the privilege of teaching as instructors and where we took many of the photos that we used in the New England field guide. In the evening we went to the fine nature center run by Maine Audubon at Gilsland Farm, just north of Portland. By now we've given our program about the new field guide more than a dozen times, but we're still having fun with it; and we had a great crowd for the presentation tonight, including more friends that we hadn't seen for a long time. Very late at night on Friday we finished tallying up our trip list so far, and it came to 337! We are getting very close to 350, and that's fortunate, because we are running out of potential species to add. From here we head back across New Hampshire and Vermont, through country where most of the flowers and butterflies are done for the season... and besides, there's a hurricane on its way. Wish us luck! Can't help you with the moose in Maine...the summer I worked at Acadia we saw nary a one! Sheesh. Stay safe over there. Sounds like you two have been enjoying the sights and species.... Your posts have been inviting--like I want to get on a plane and fly out there! Hope the weather cooperates so that you guys can fly out as planned. Ottawa County isn't the same without you! I'm proud of the important work you're doing in the name of birds, conservation, birders, and beauty. What a powerful team you are. Back here on the home front, I've been enthralled by all the fall migrants. Kinglets all over the place! And those snappy Red-breasted Nuthatches.... Skittles is beside herself! The kaleidoscope of color this fall is stunning. Take care. And bring back loads of stories and photos! Pie awaits your return.